Host a blog hop – this is a great way to share information and increase your audience. I’ve had the opportunity to participate in several blog hops over the past few months. If you want some tips, check out my previous posts on hosting a blog hop and creating a button for your blog hop. 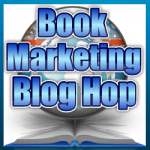 You can also use a blog hop to run contests or have people enter for a free copy of your book. Create something of value to give away – This sounds counterproductive; why would you spend time creating something of value and then just give it away? If you want people to BUY products from you, they need to trust that you have something that will be valuable to them. Most people are willing to give you their contact information (name and e-mail address) in exchange for something free. I’m currently in the process of updating my blog/website. When I launch my new site, I’m planning to give away Twitter Tips and Tricks for Writers as a way of building my contact list. Create graphics to share on social media sites – Whether your book is fiction or non-fiction, you can find quotes or snippets to share. Go through your manuscript and highlight what you want to share. Then, create graphics using software like The Logo Creator or Logo Design Studio Pro. This can be as simple as using a plain background and placing the quote on it or pairing the quotes with pictures you’ve taken. Make sure you include the title of your book and the link to your website so that it’s easy for people to find more information. Once you have a graphic, you can share it on Facebook, Pinterest, Twitter, Instagram, etc. Interact with your audience on your Facebook Author Page – This is a strategy I’m just starting to experiment with. (You can connect with me at https://www.facebook.com/AuthorRuthL.Snyder). If you haven’t set up an author page yet, check out this tip page offered through the book marketing challenge. Facebook Pages give you the opportunity to reach a wider audience, “boost” posts you want more people to see, and receive stats that will help you determine how to use the page most effectively. If you want more information, check out The Ultimate Guide to Facebook Marketing on Copyblogger. Use press releases – I’ve found this to be a very effective way of letting people in my local area know about my books. When my novella, Cecile’s Christmas Miracle, was released I put together a press release and sent it out to four local papers. Three of the four responded. One paper printed an interview, another paper printed the information in the press release almost word for word, and the third paper highlighted the release of my book. For more ideas, check out Connie Dunn’s post on Marketing Your Book with Press Releases and 4 Tips for Creating the Essential Press Release by Sandra Beckwith. Thanks for stopping by. You are wise to pick smaller goals that you can achieve. It sounds like we write similar material. I look forward to getting to know you better. Wow Ruth, When I read blogs like this it make me anxious to go through all this material again. I knew this would be a challenge for me time wise so I became a gold member. knowing what valuable material D’vorah puts together I really didn’t want to miss anything. I have tried to take a look at the daily summary but you have put those and more together in this blog. I too will be looking forward to getting to know you better Ruth, as I read your “about me” we actually have a lot in common. Thanks for your encouragement. We all benefit when we share with each other. I look forward to learning more about you. I love the opportunity to meet and connect with so many great folks from this Challenge! Looking forward to seeing us all succeed! Ruth, thank you for the tips! That was helpful. Up to now, I found the free promotions very effective in my marketing. I am planning on sharing my strategies and results on my blog as I go. Good luck! You’ve summarized five crucial points. I especially like the tip about taking a quote from your book, adding a graphic, and posting it on Facebook. Easy and effective. Good luck with your writing and marketing. Thanks for stopping by and leaving a comment 🙂 Best wishes with your writing and marketing too. Ruth~ You’re right, the Build your Business with your Book Challenge, did a lot more than give us info on what to do,, each session shared how to do it and tools to make it happen. Wishing you great success. Thanks for stopping by. Best wishes to you in your marketing journey! Ruth, thank you for your reminders of so many of the good things we’ve shared over the past five weeks. All the best as you move forward in our together adventure of marketing our books! Love the Blog…Delighted you are on a similar path to mine and love the fact that you contributed to the Chicken Soup series! How exciting! It has been a pleasure to take this journey with so many talented folks such as yourself. I look forward to sharing our successes in the days and years to come. Thank you for being an inspiration and for sharing. I appreciate you stopping by and encouraging me with your comment. Best wishes on your marketing journey. Hi, Ruth, Thanks for sharing, one writer to another.Let me know if you’d like to guest blog on my site! Great job Ruth, You provided so much free stuff in your blog. I must check out the Facebook marketing. Once I get back to Facebook in the next day or so then I will give a like. Thanks for stopping by and leaving a comment for me 🙂 I’ll check out your blog. Ruth, thanks for your informative review of what we learned. This is great: simple and to the point. I wish you all the best with your author journey and Happy Marketing! Thanks for stopping by and visiting. Best wishes in your marketing journey. Ruth, I’ve bookmarked your article. I love the ideas you shared along with everything else we’ve learned. Much success to you. Thanks for stopping by, Desiree. Thanks for stopping by and connecting with me. You’re right, marketing can be fun 🙂 I’m looking forward to continuing the enjoyable journey with you.